I moved to Prague in August 2015, and I love it here! It’s not the perfect place, but it has a lot going for it, including a thriving vegan scene. 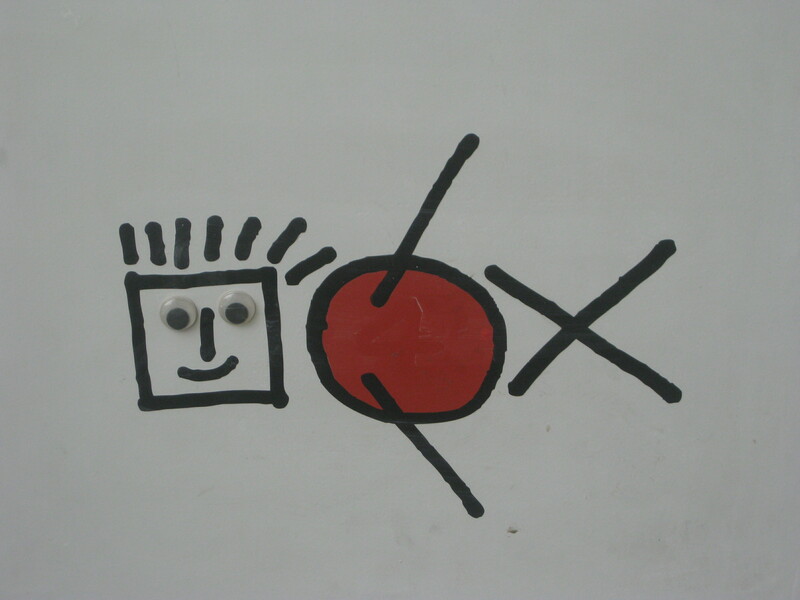 The Dox Gallery is one of my top recommendations in Prague, even though I’ve only been once. 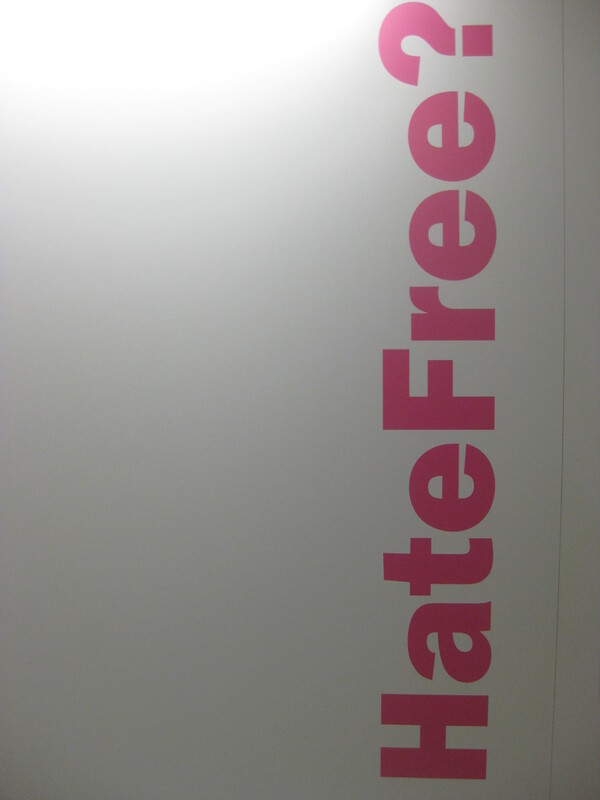 We only stumbled upon it when I read about an exhibition called HateFree? that was taking place there. The Czech Republic is not a very racially diverse place, nor is it very welcoming to refugees. There are fairly frequent anti-Islam and Pegida rallies, which are sometimes attended by the president, and a lot of my students who seem really warm and kind sometimes come out with racist comments so casually that it takes my breath away. So I felt like this could be an interesting exhibition. And it was indeed. We learned about an extremely unpopular pig farm built on a Roma Holocaust site, hate mail sent to the parents of the Czech Republic’s first quintuplets (born to a non-white family, alas) and an initiative that gives homeless people the chance to cook food for other homeless people. And the rest of the gallery turned out to be just as good. The Supermarket of the Dead exhibition was fantastic: lots of paper replicas of real items that are burned in China to send them to relatives in the afterlife. 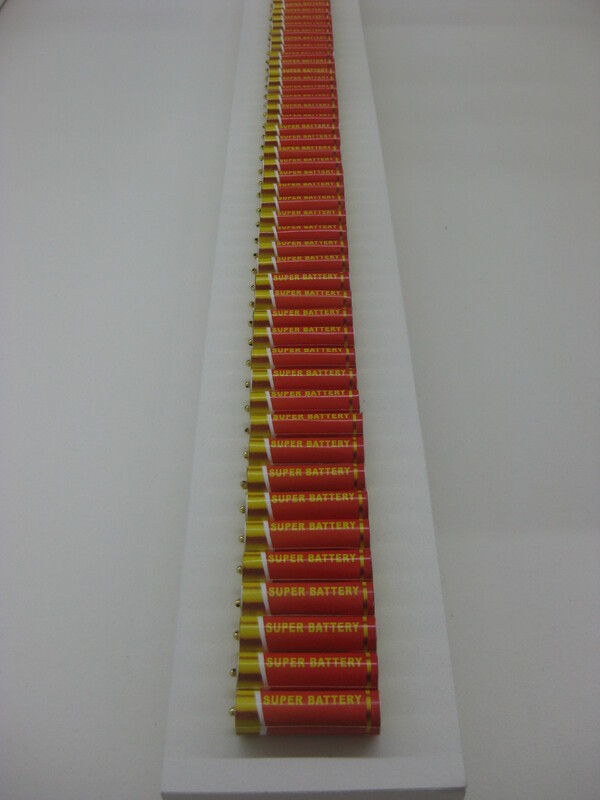 Who wouldn’t want a gun with them in the afterlife? 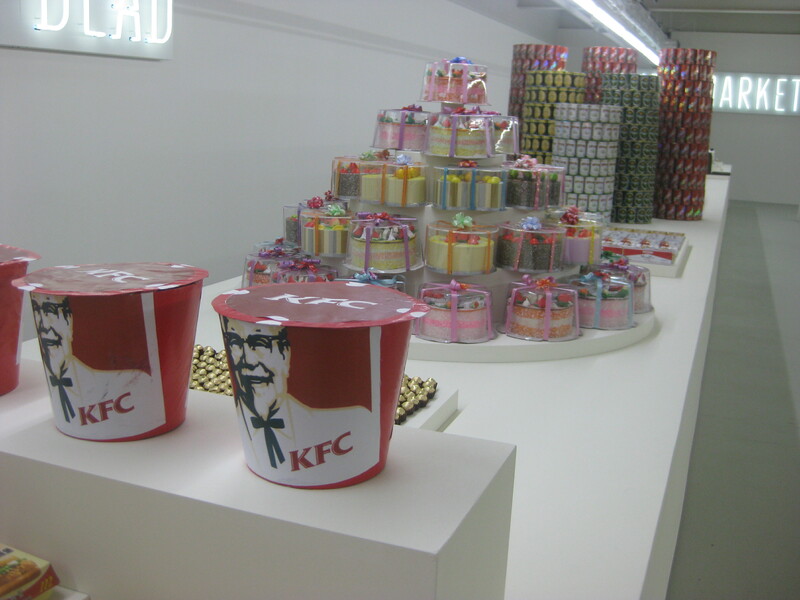 Or a bucket of KFC, or a packet of batteries?! 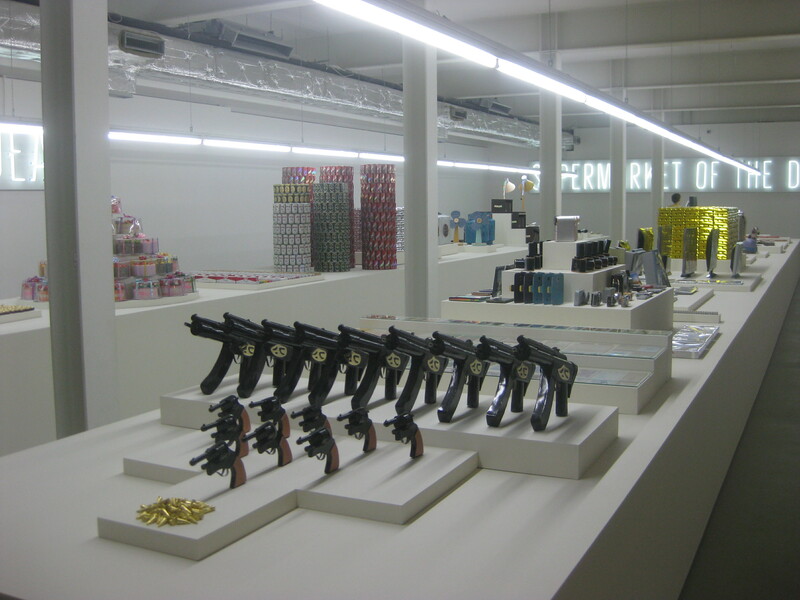 There was also an exhibition about the evils of money. 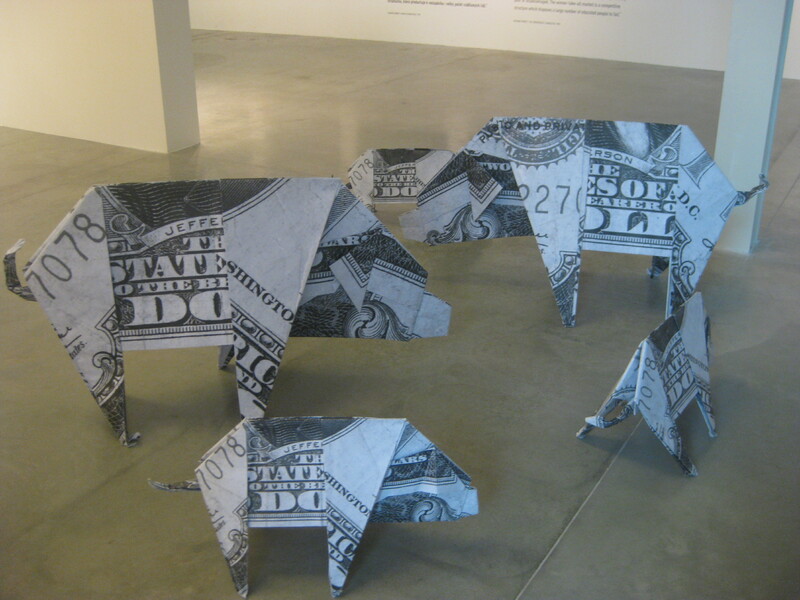 I enjoyed these $2 bill pigs, as well as nooses made from cash. 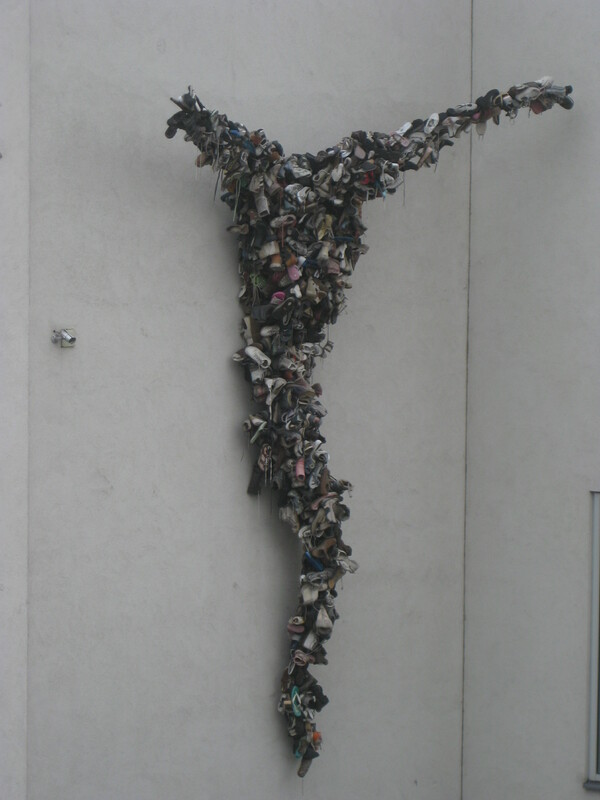 Most interesting of all were some photographs of slave labour in different countries around the world, including Nigerian prostitutes working in the wilderness outside Rome and child labourers in a leather factory, with a warning about knowing where these dirt-cheap clothes come from. 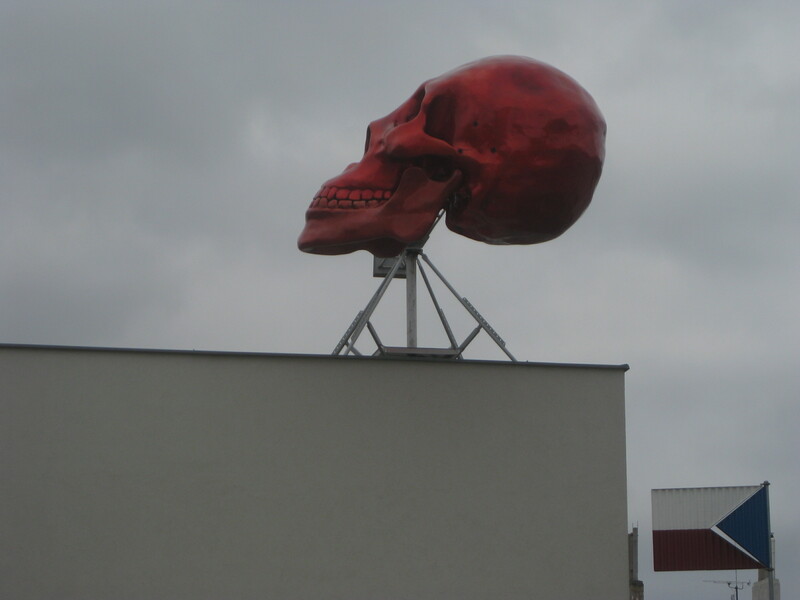 The outside terrace has a view of the rotating red skull pictured up top, and a Jesus made of shoes. 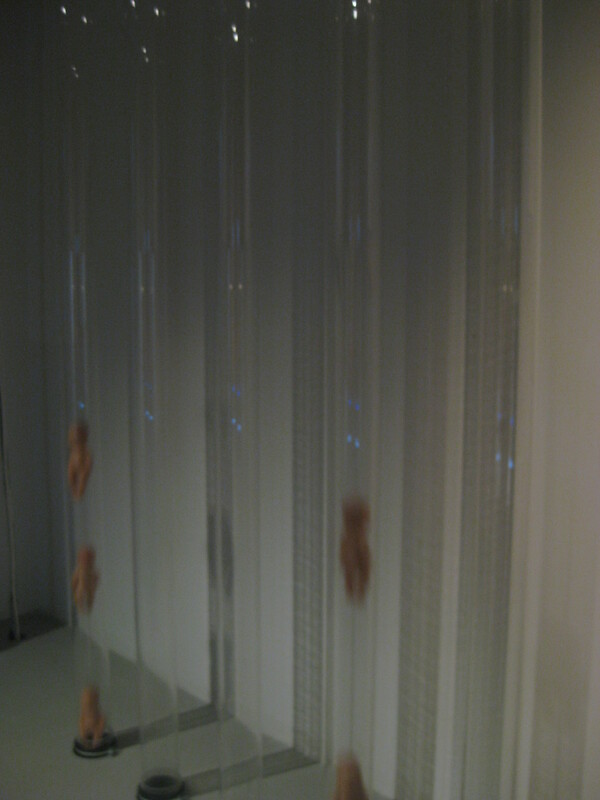 And on the upper floors there was an exhibition based on Brave New World, which was suitably creepy. It featured plastic dolls whizzing up and down tubes, leading up to a baby conditioning centre which was just awful – which means it was really well done! I know absolutely nothing about art, and I only like things that look pretty or things that give me something to think about: all of the exhibitions here covered the latter, so I would really recommend it. It was 180kr each, and well worth the money. 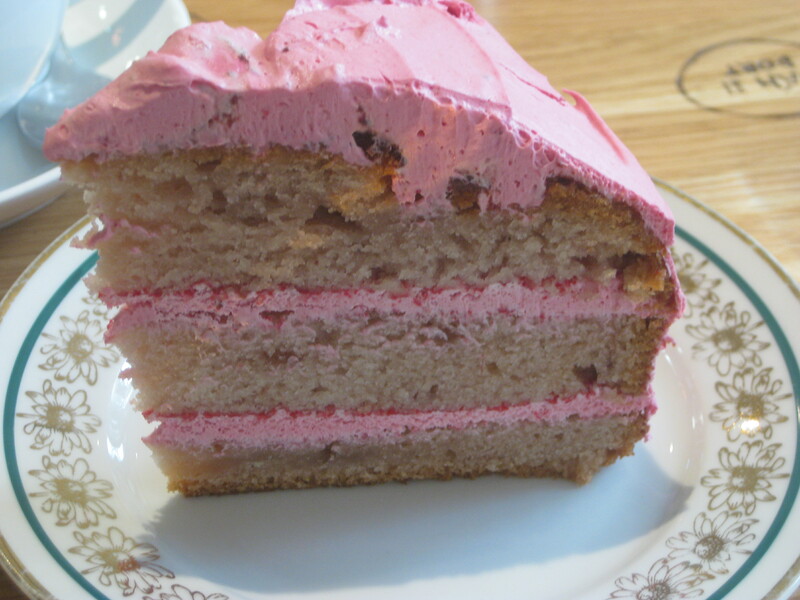 And on the food front: here is a year in cake from my favourite supplier, Moment. There are a lot of treats here, but in my defence it’s actually more than a year and it’s from two people, so this is definitely an acceptable amount of cake, thank you very much. 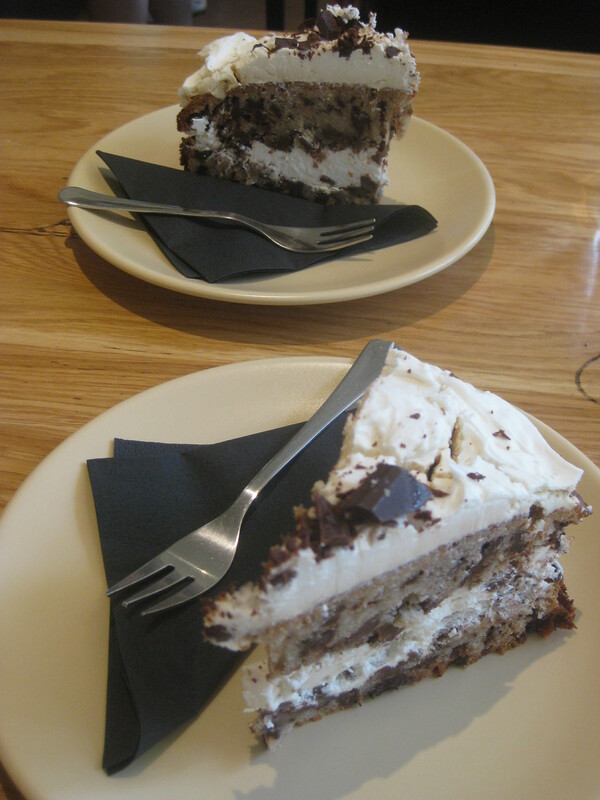 Moment is the best cafe in Prague: they always have about six cakes to choose from, and they’re pretty much always excellent! 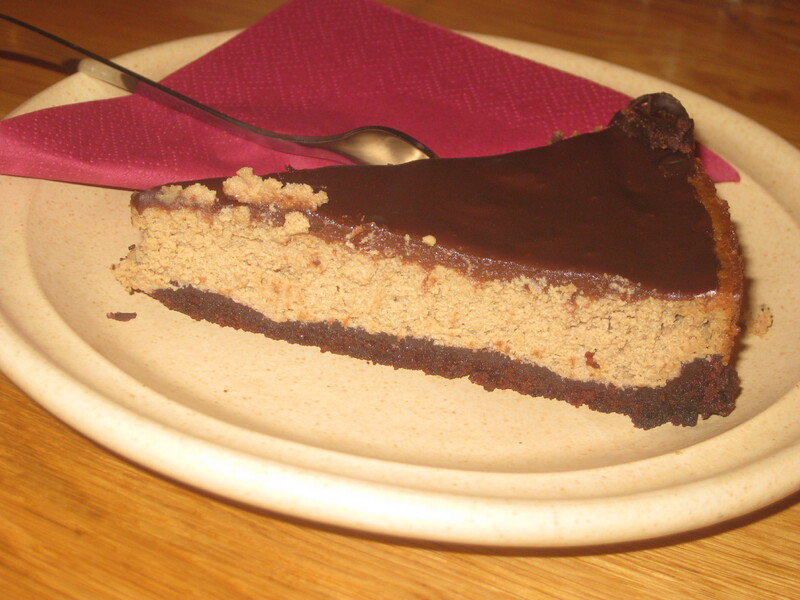 Chai latte cheesecake: so flavoursome. 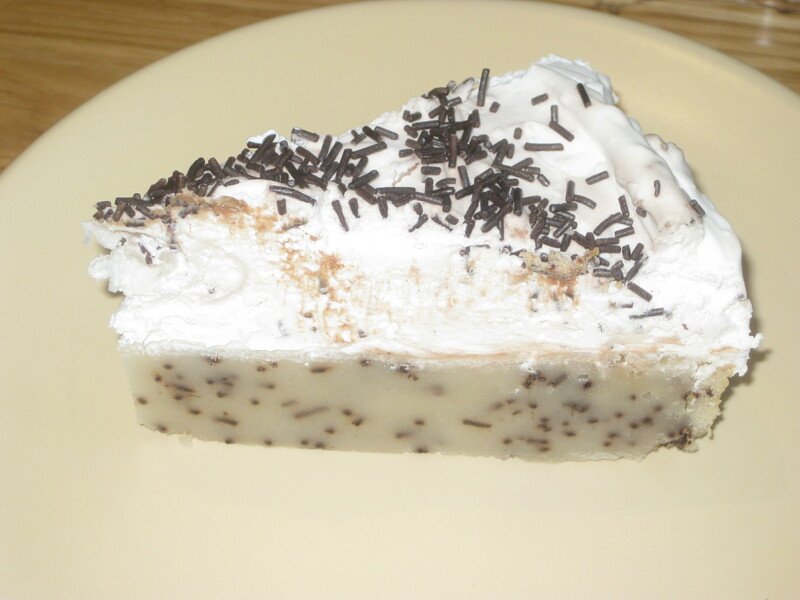 The chocolate layer on top really makes it. 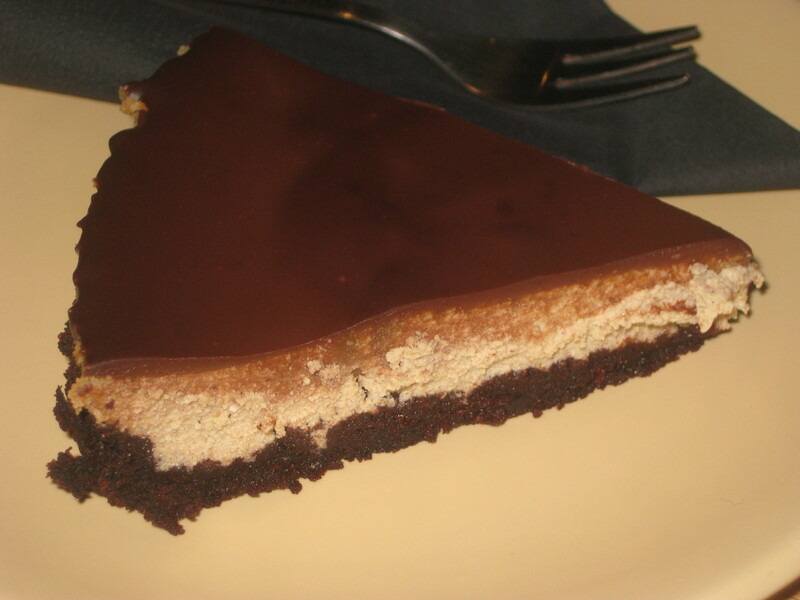 Gingerbread cheesecake: it looks almost the same, but it’s different, I promise. It was really good and gingery! 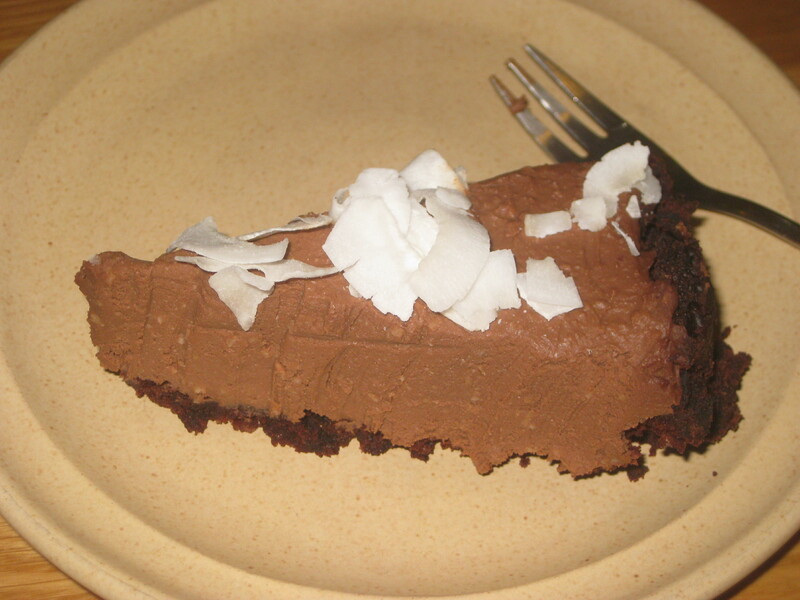 Chocolate coconut mousse cake: small, but sublime! 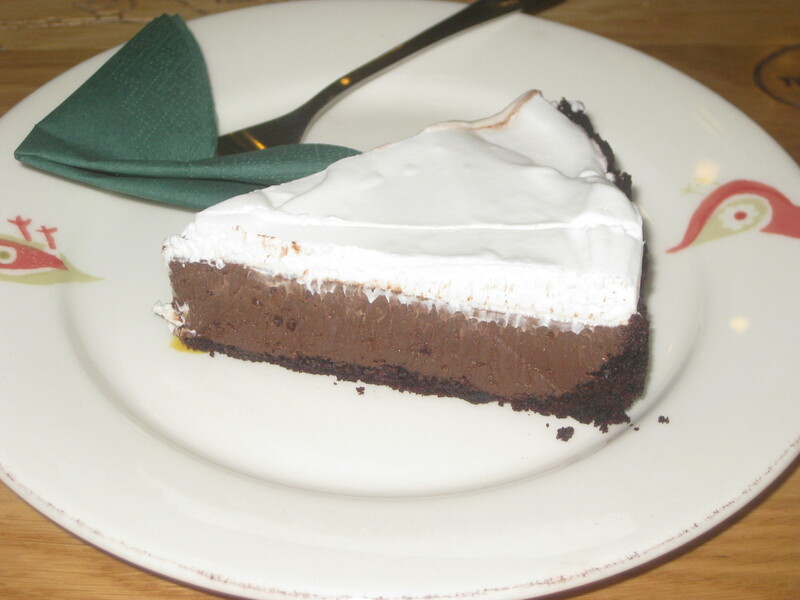 Chocolate mousse with whipped cream: this was every bit as good as decadent as it looks. Oh for a crunchy base, though! 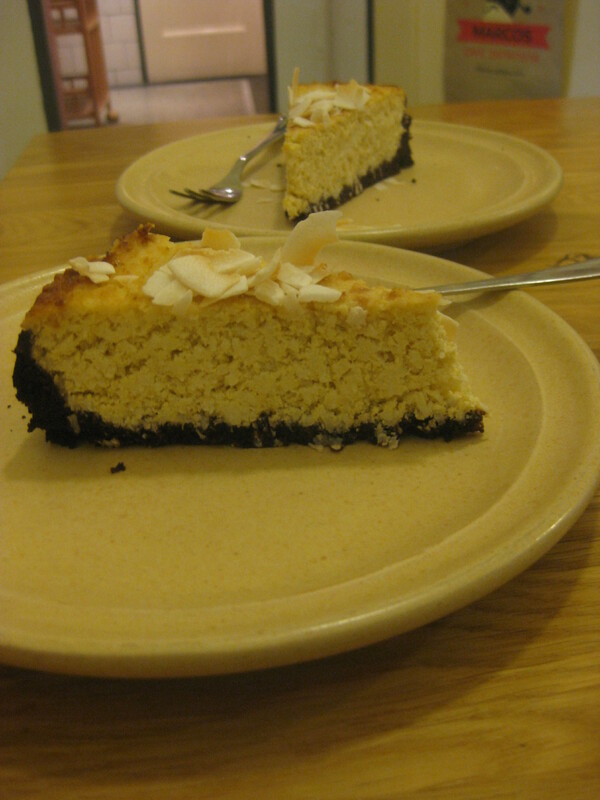 Coconut cheesecake: a weird texture, not very smooth and creamy. A bit more base would have been nice too. Great flavour though. 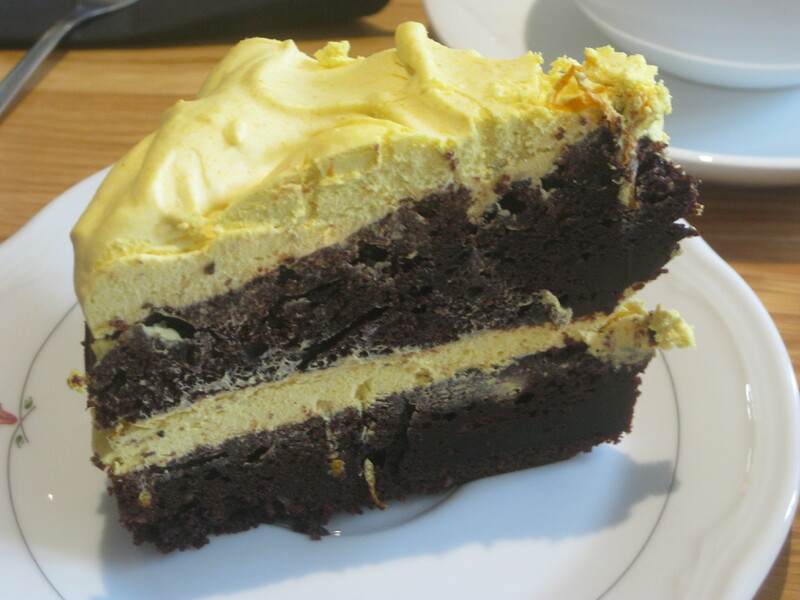 Chocolate orange cheesecake: so decadent! 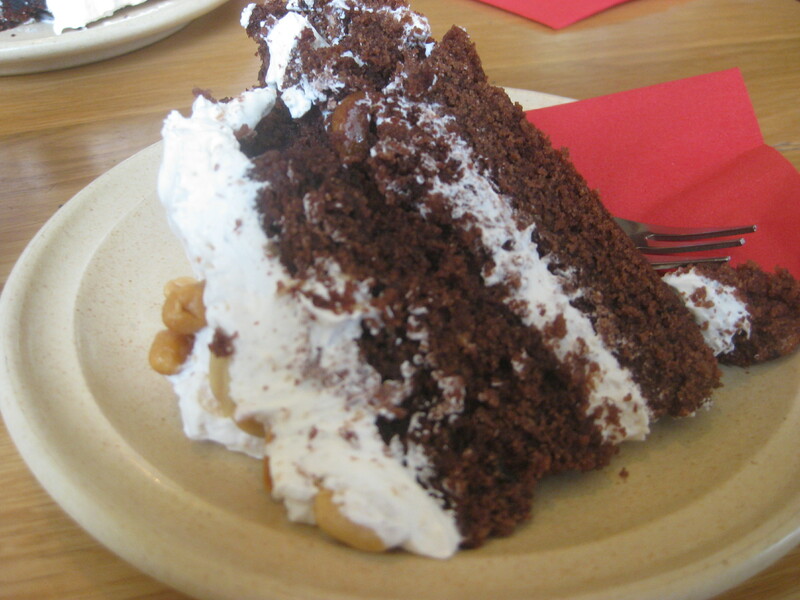 Molehill cake: this is a traditional Czech cake, consisting of a spongy chocolate layer, sliced banana, a mountain of cream and some chocolate crumbs on top. Unsurprisingly, it’s very good. 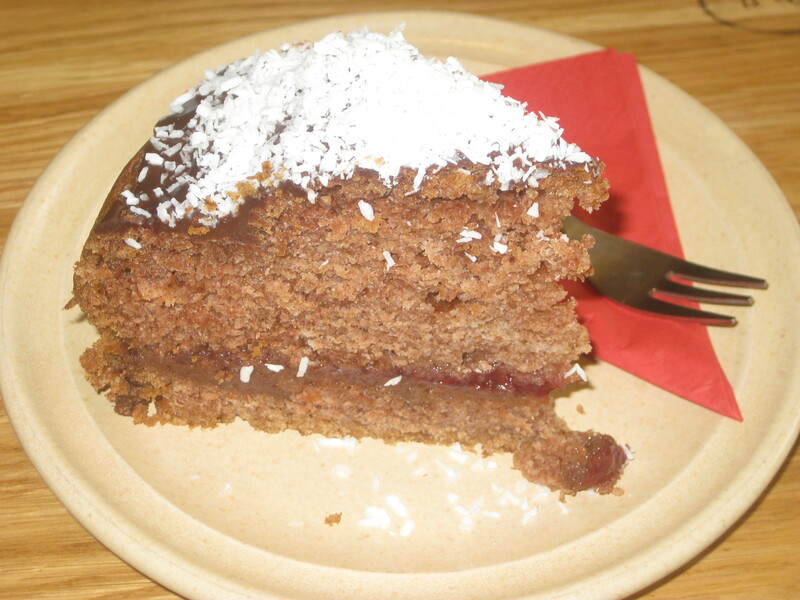 Cherry and poppyseed: Czechs love a good poppyseed sponge! Despite being a little burned on top, this was lovely. 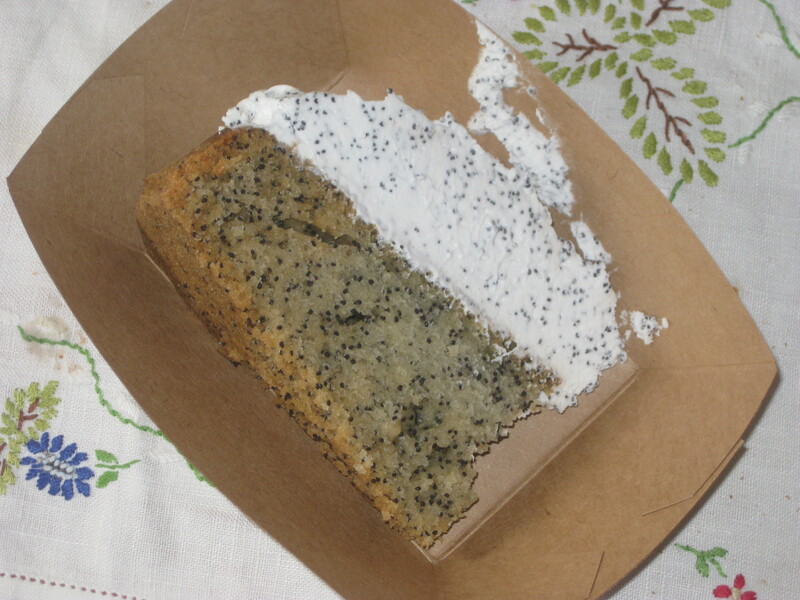 Plum and poppy seed cake: this, on the other hand, was really weird, and didn’t taste of either plums or poppy seeds. This one now always gets a definite no from me. 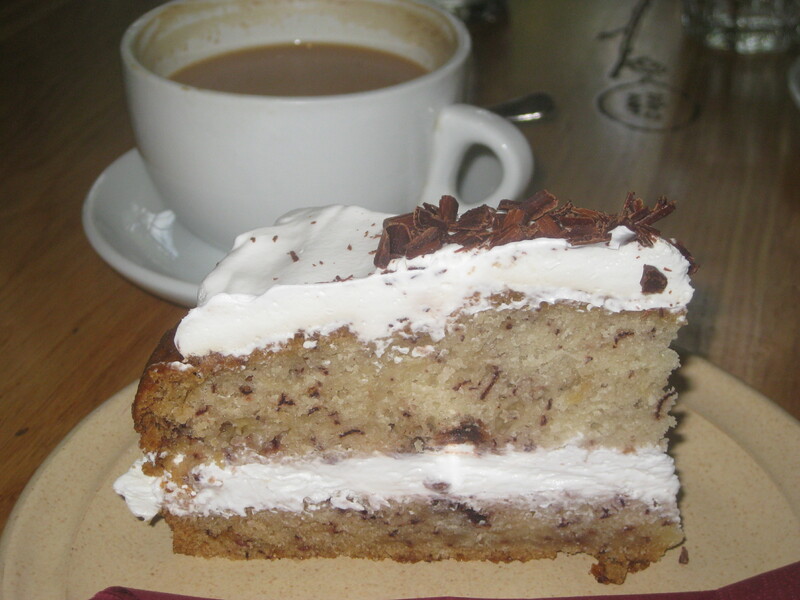 Coffee and cardamom: it contains coffee beans, so there’s plenty of flavour for all you coffee lovers. Coffee, cardamom and chocolate: the coffee flavour only came from the decorative coffee beans, so even a coffee-hater like me could probably have handled this one. 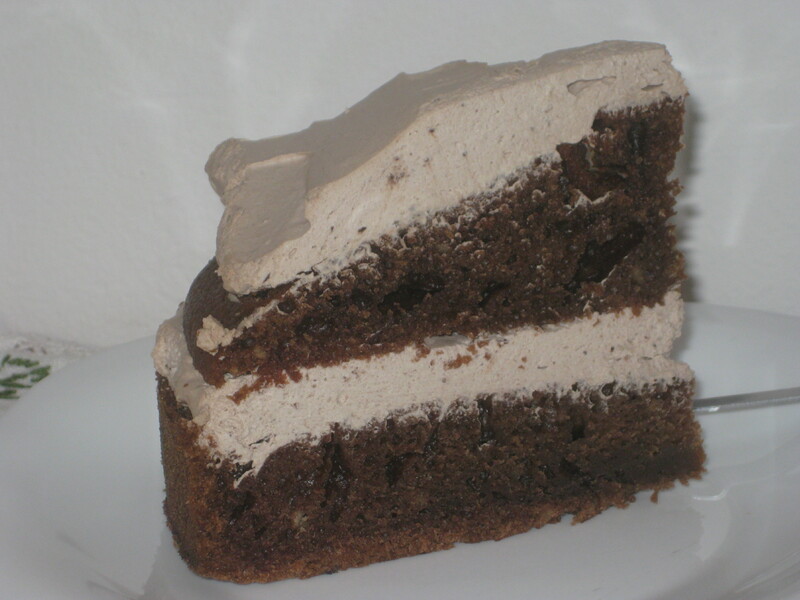 Chocolate coffee cake: reportedly a good strong flavour. 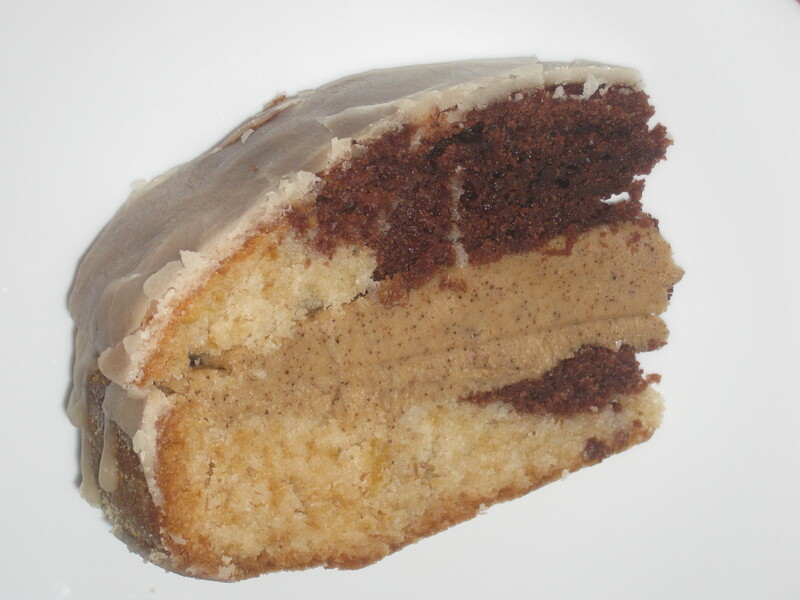 Coffee cake: this looked so inviting that I hoped it would have a really mild coffee flavour so I could enjoy it too. Alas, it tastes very much of coffee. Coffee-lovers, rejoice, I suppose. 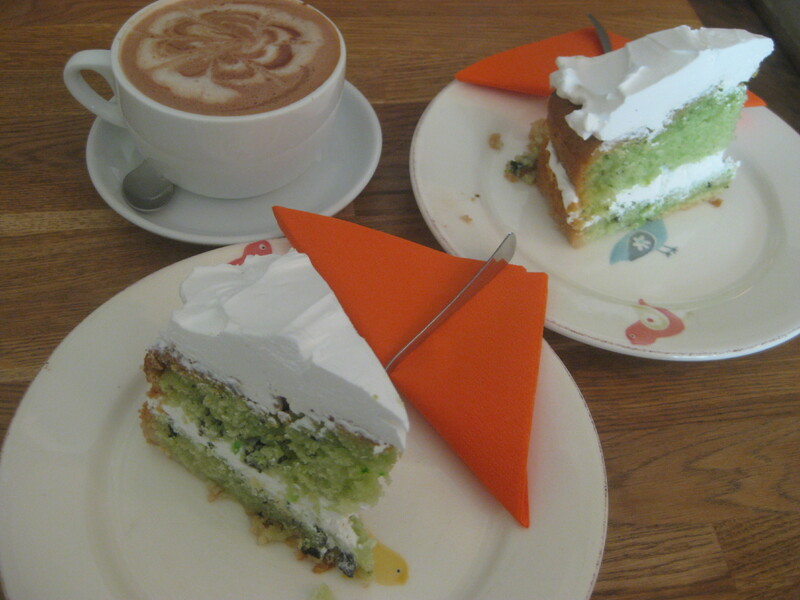 Matcha cake, two ways: finally onto the good, tea-based stuff! 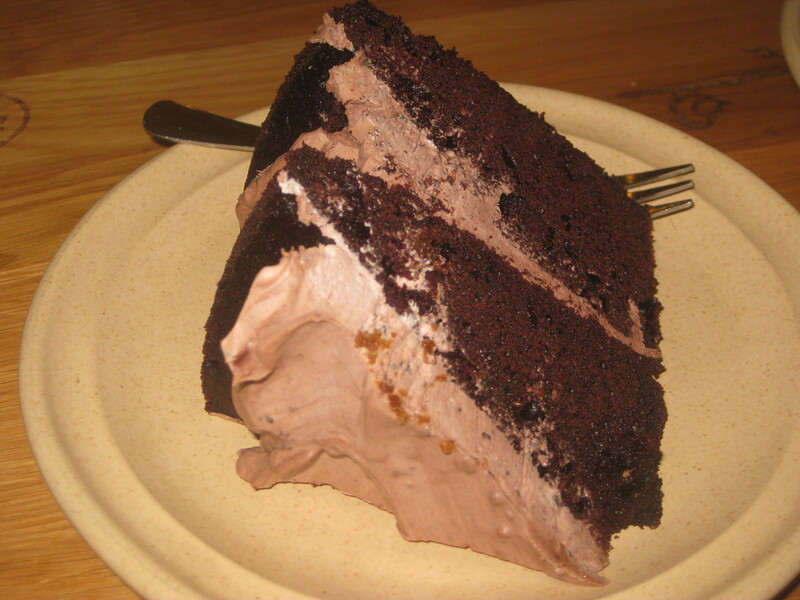 This cake always has a fantastic texture. 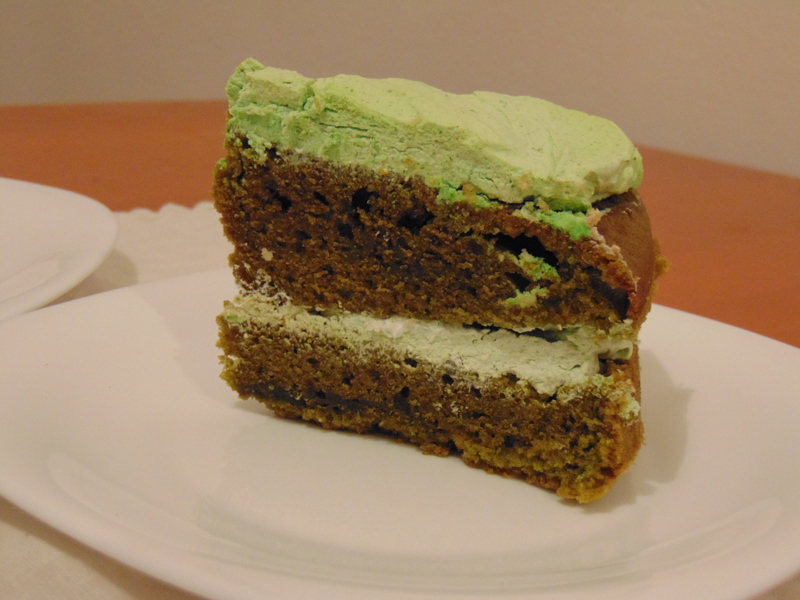 The green icing is more appealing, of course. Raspberry: simple, fruity and delicious! 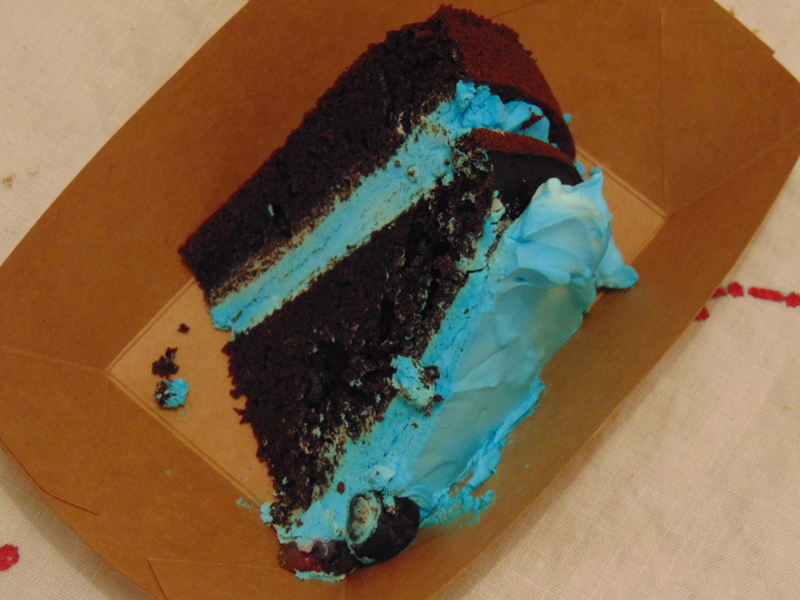 Blueberry cake: it looks really fun with that bright blue icing! I hate blueberries too much to try it, but Dr HH said it actually wasn’t that fruity. Orange and lemon triple layer cake: vibrant and zingy! 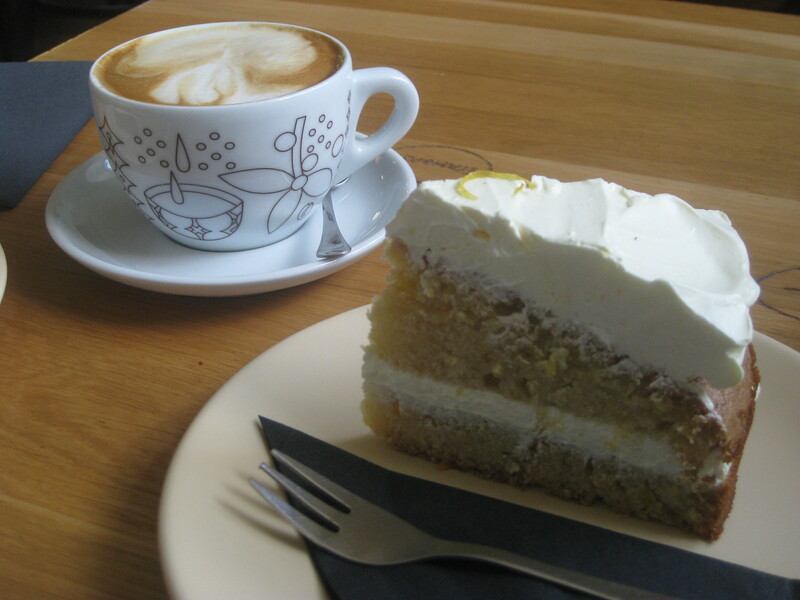 Pina colada cake: a sure sign that summer had arrived! 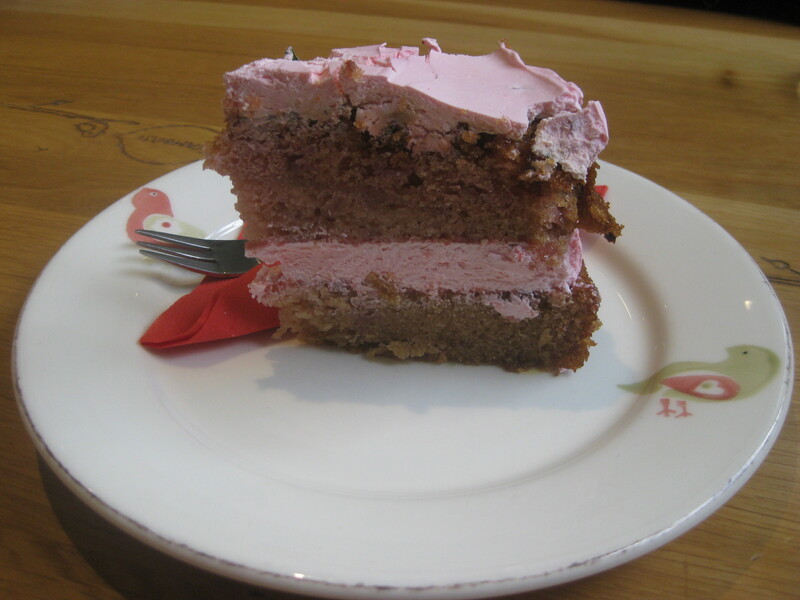 Blackcurrant cake: I hate Ribena with a fiery passion, but I loved this! 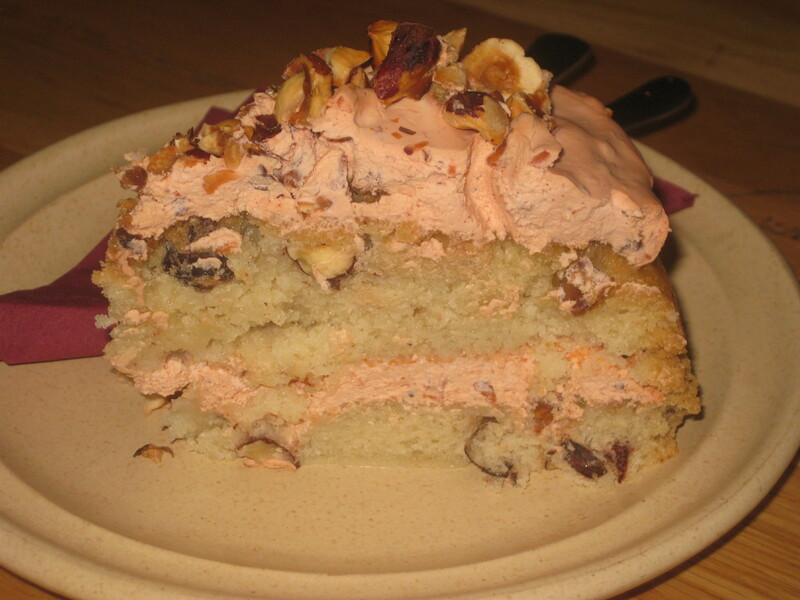 It was really fruity, in both the sponge and the icing. 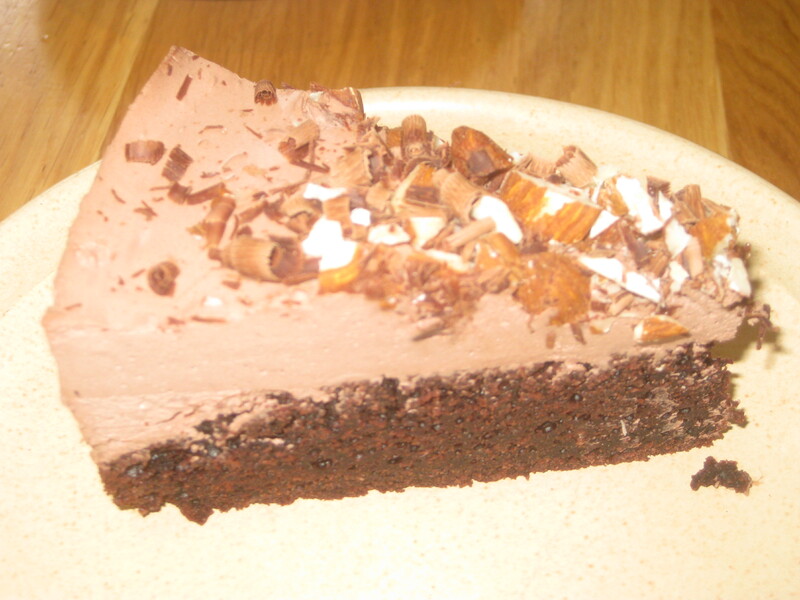 The chocolate lemon salt cake: it would have been so good with just a little sprinkling of salt. As it was, the big salt crystals were a bit too much. 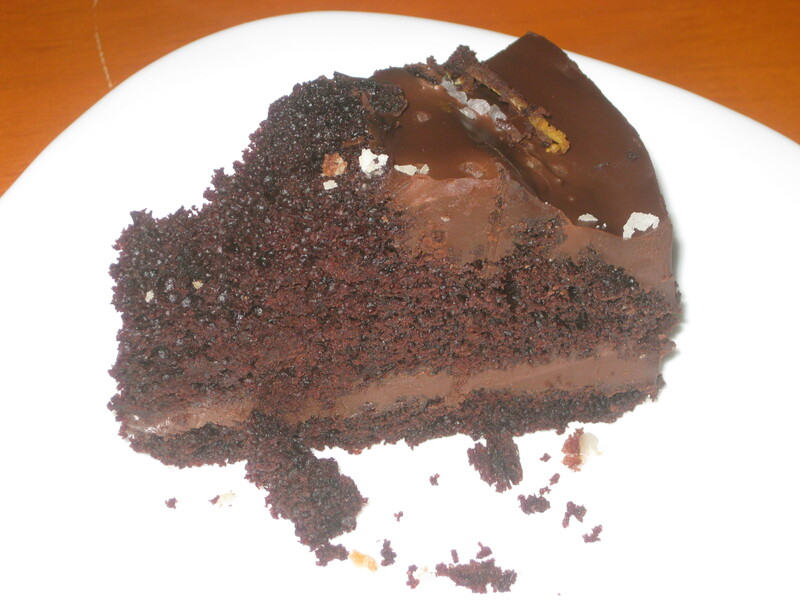 Chocolate and lemon were a winning combination, though, and the icing was spectacular. Strawberry and vanilla: pretty, tasty and triple-layered. 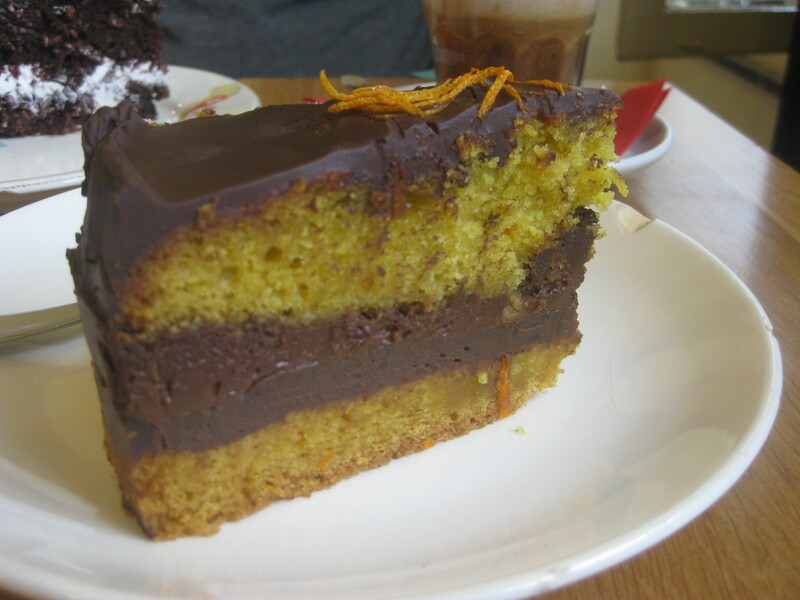 Chocolate orange cake, in three different forms: this is always a winner, however it’s presented. 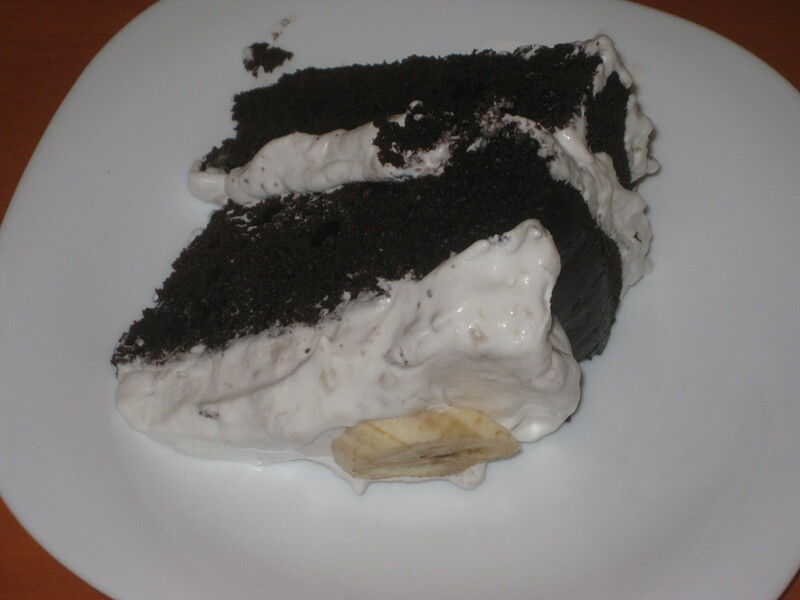 Chocolate banana cake, two ways: a really good chocolate sponge sandwiched with gooey and delicious banana cream. 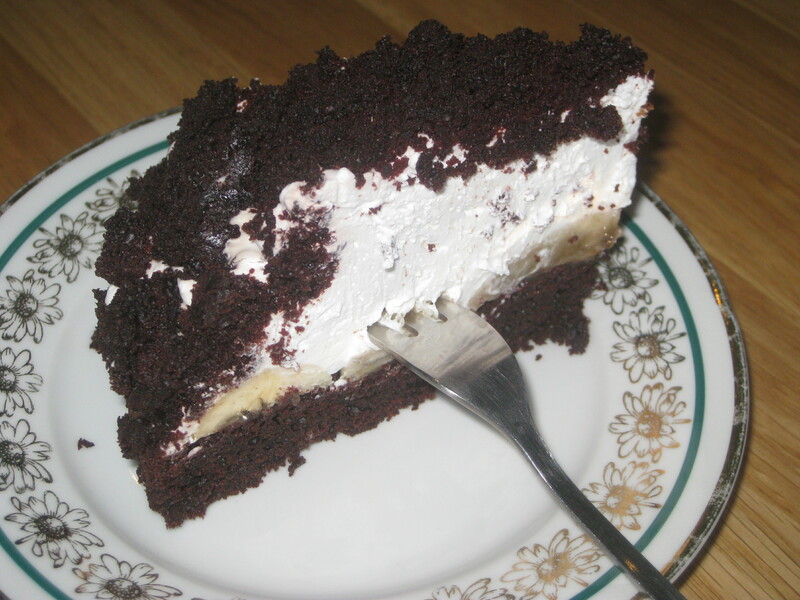 And a sturdier, perhaps better one with gooey banana slices in the middle. 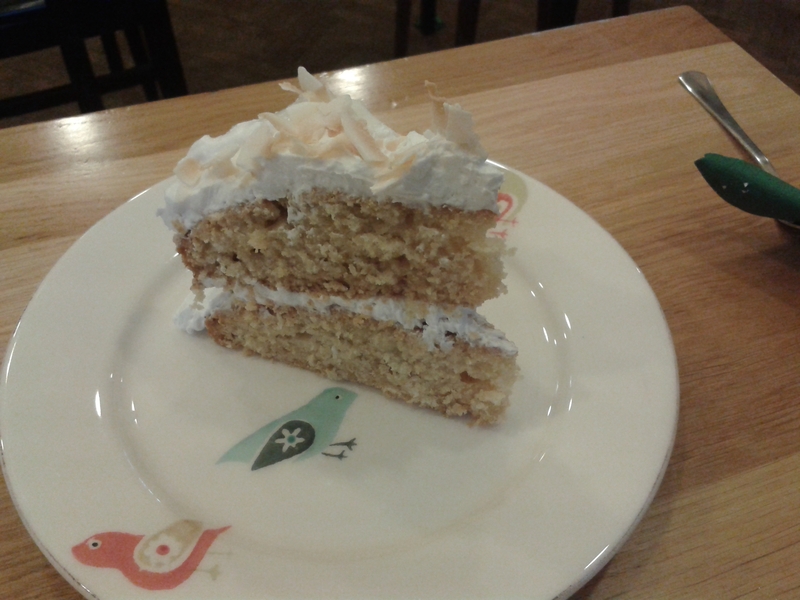 The pineapple, coconut and walnut cake needed to amp up those flavours, but it was good and moist. 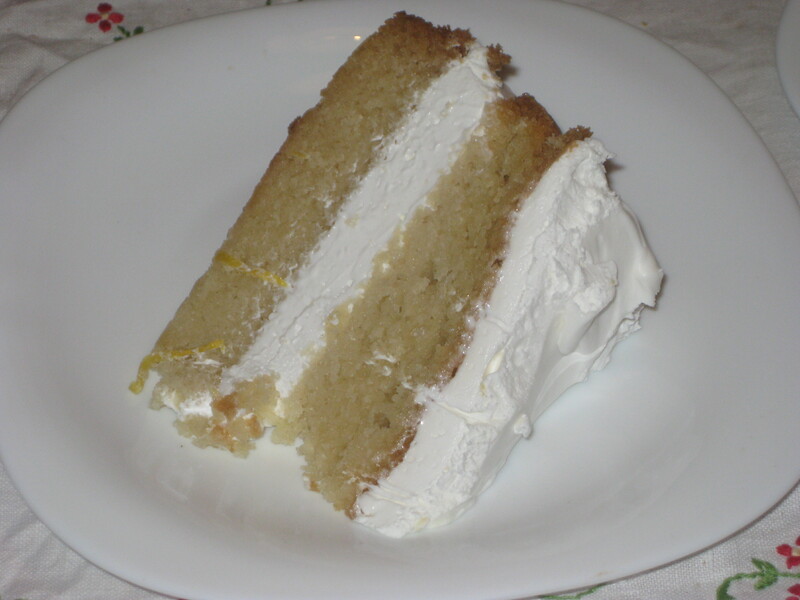 Lemon cake: fresh and zingy! Banana chocolate chip cake: the best of both worlds, fruit and chocolate. 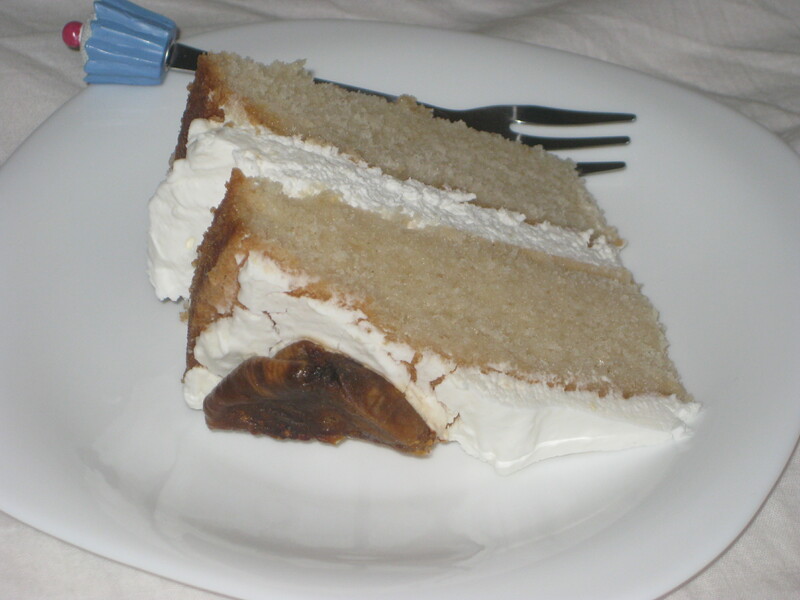 Fig and vanilla: the only contribution from the fig was the decoration on top. I’d have happily left it off and just called it a vanilla cake. 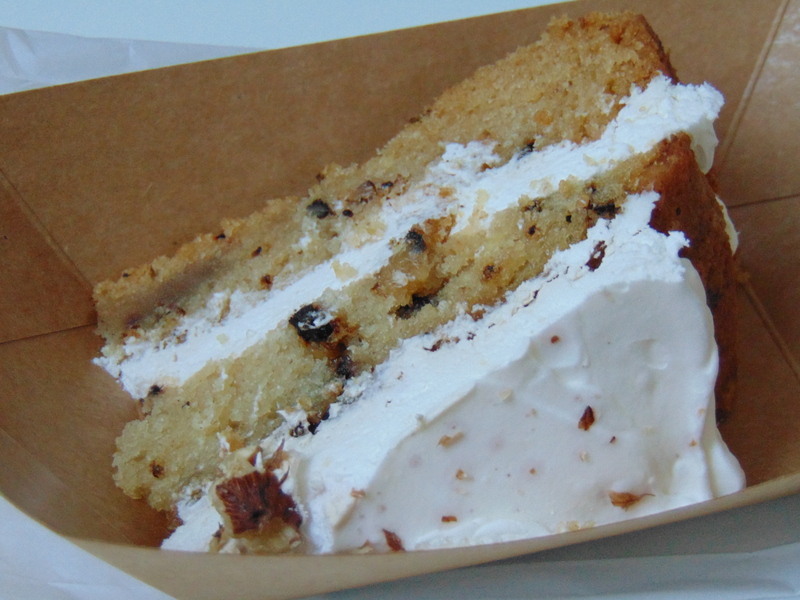 Baobab and chocolate chip cake: I have no idea what baobab really is, but this was sweet and delicious. 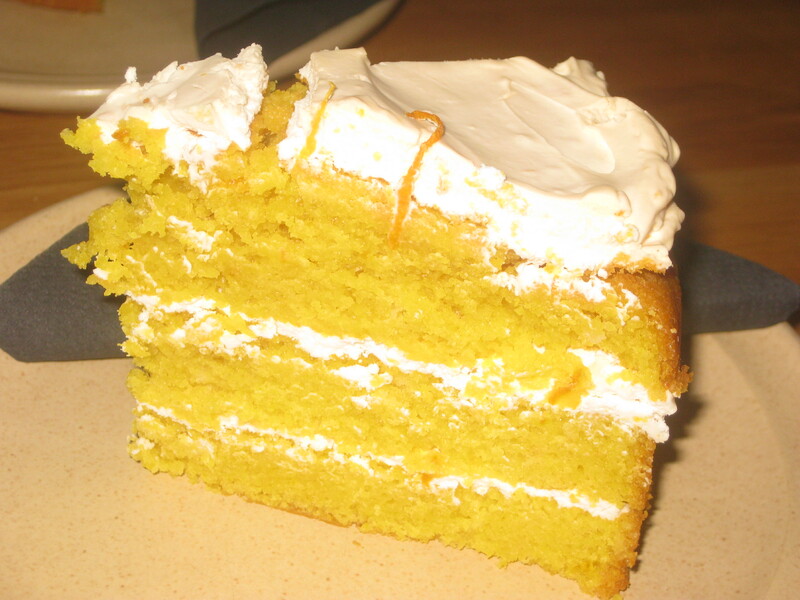 Orange and lemon cake: fruity, light and perfect! 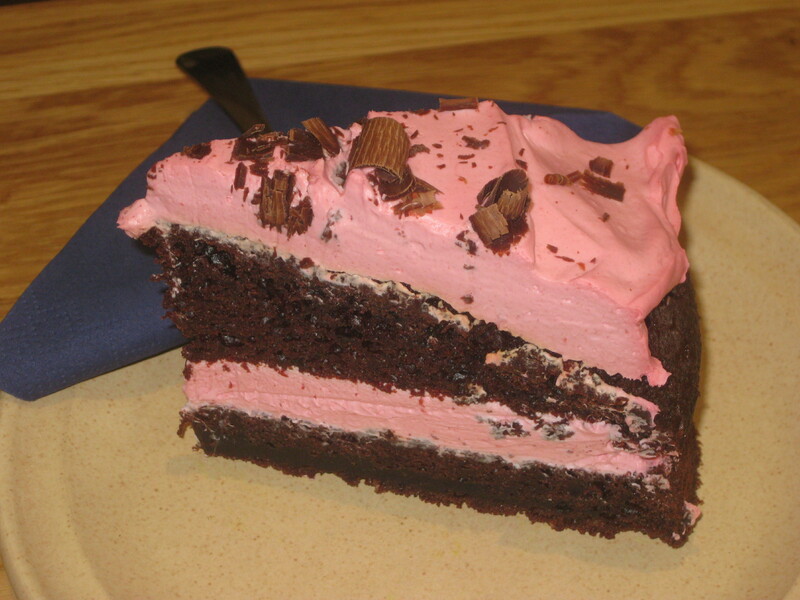 Chocolate and strawberry: so pretty! 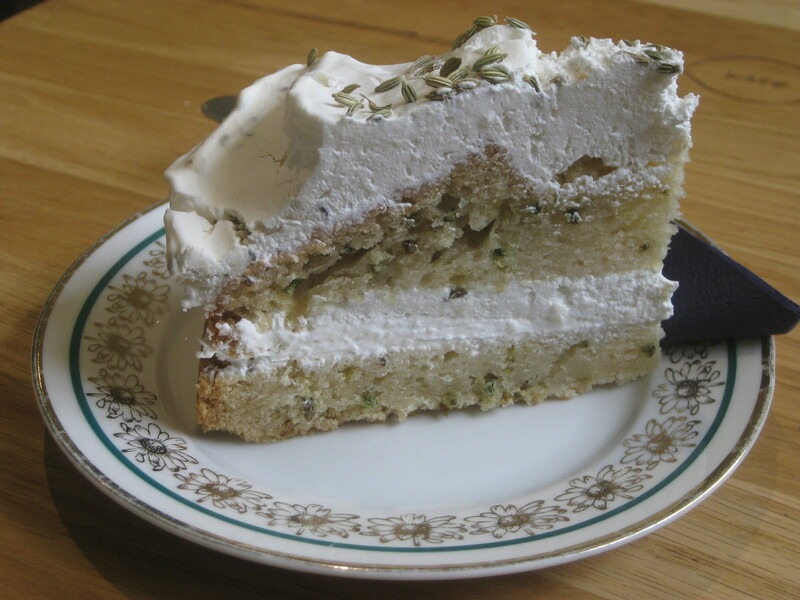 Lemon and basil cake: it’s green! Also, good. 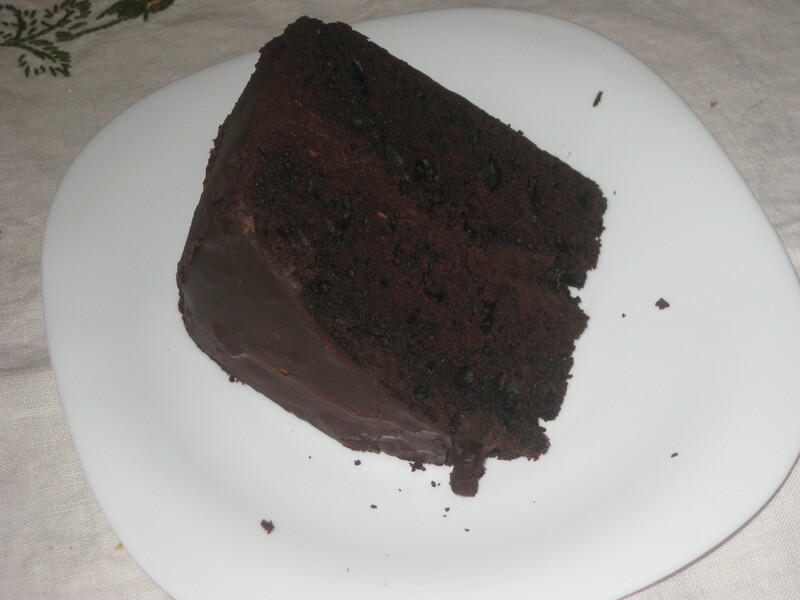 Mint chocolate cake, could have been mintier, but one of their better chocolate sponges. Coffee and hazelnut, apple and cinnamon: both flavoursome and creamy. Fennel and anise: an unusual flavour, but a delicious one! It was subtle enough to be enjoyable, and it was really nicely baked. As usual, top notch cream. 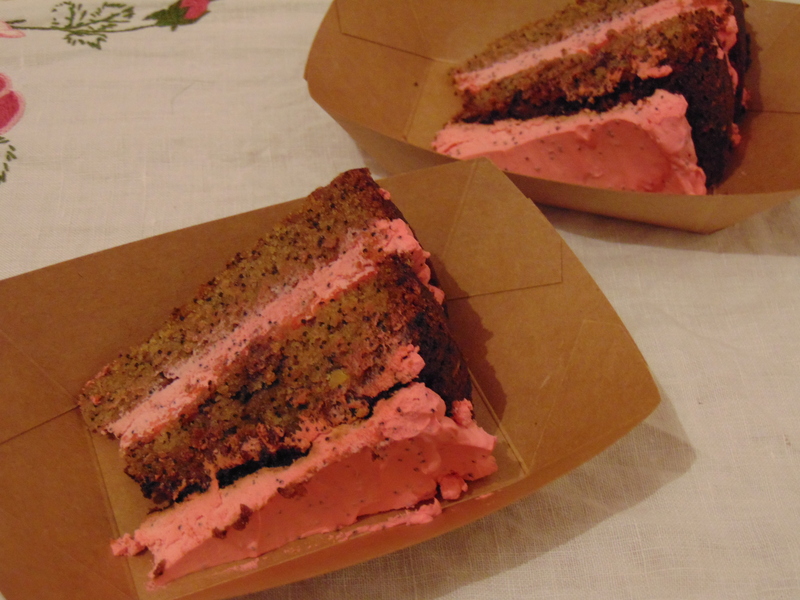 Gingerbread and raspberry: the sponge was absolute perfection, and the only thing I would change would be to add a thicker layer of chocolate on top. It was beautiful! 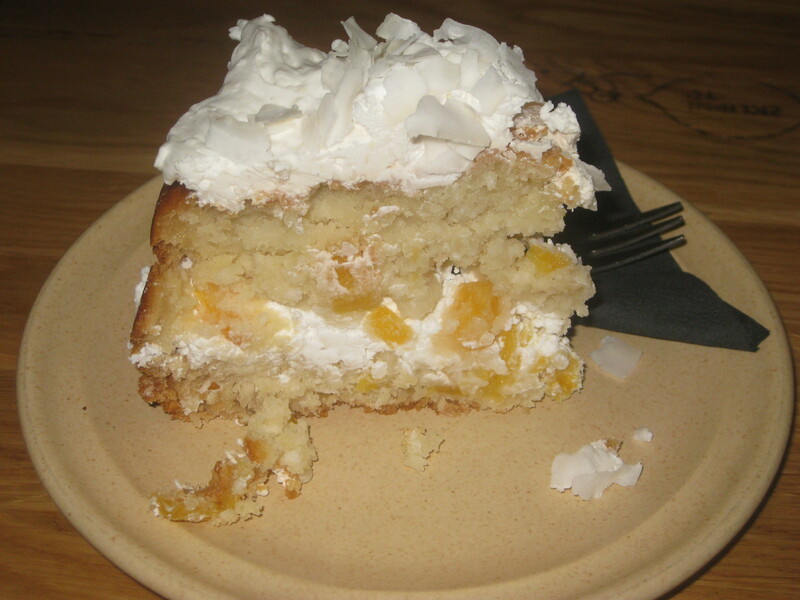 Rosemary and apricot cake: both flavours could have been stronger, but still a nice slice of cake. 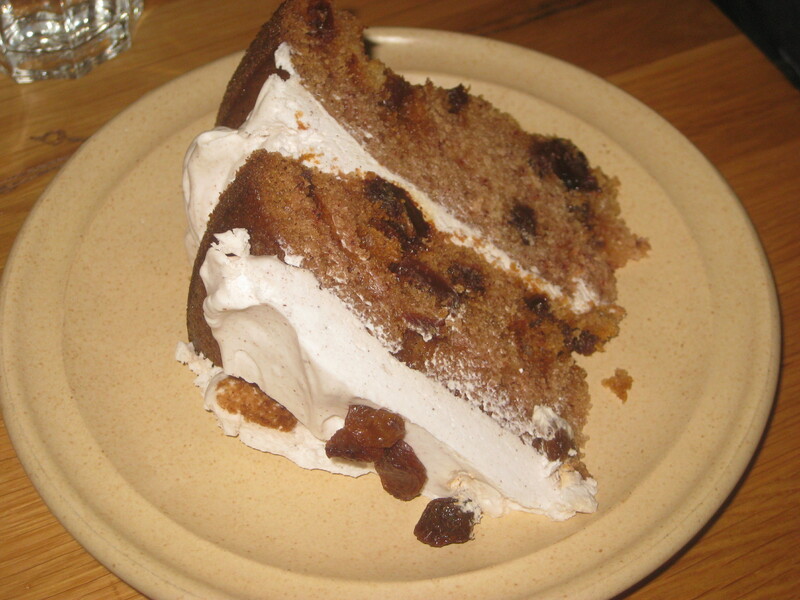 Cinnamon and raisin cake: great sponge and flavour. 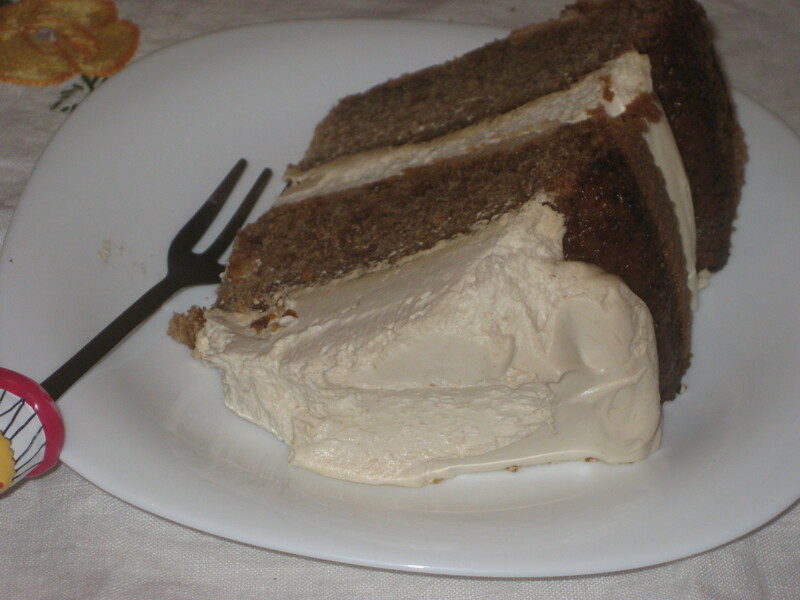 Speculoos cake (it’s basically cinnamon): delicious! 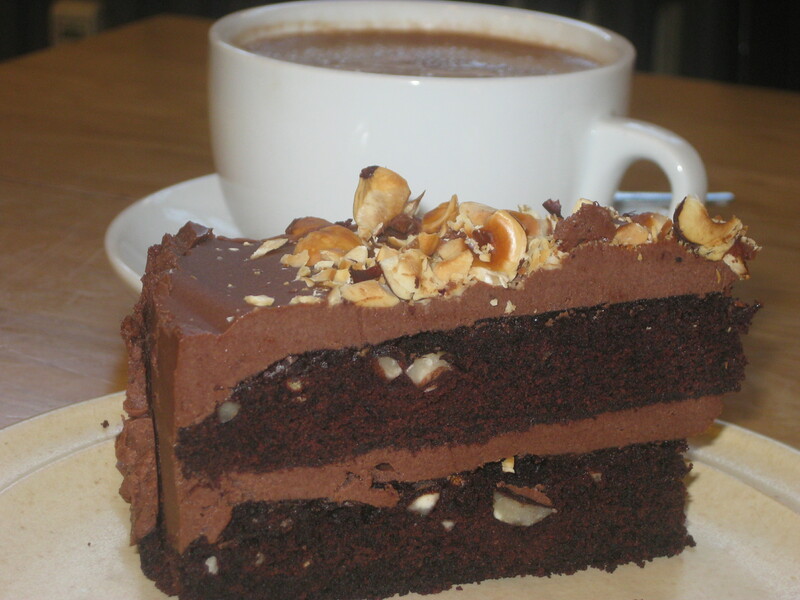 Chocolate hazelnut: with a layer of chocolate on top! Just delicious! 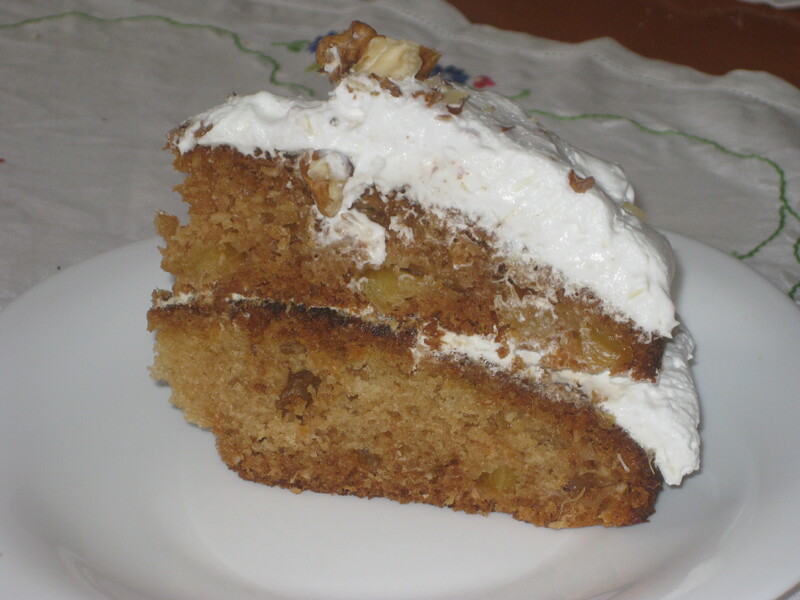 Walnut cake: sweet and creamy! 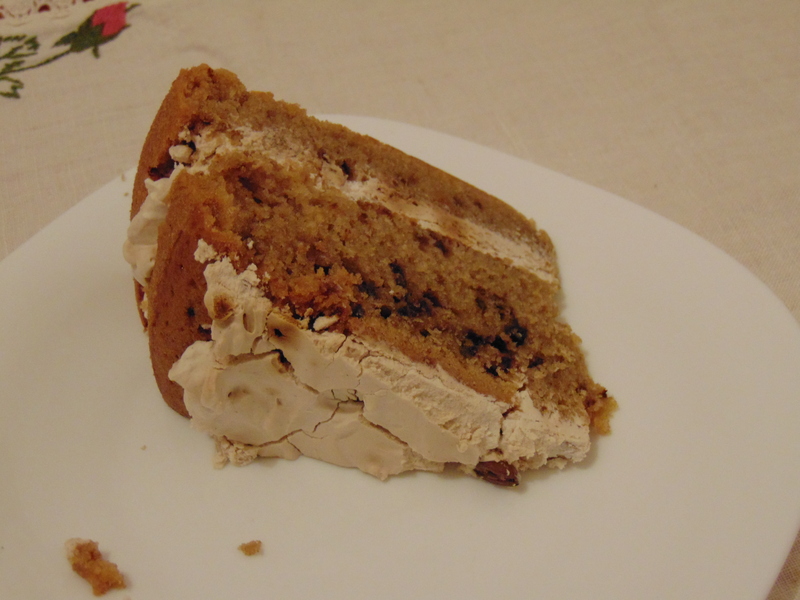 Hazelnut and vanilla cake: we shared a slice of this, but I wish I’d had a full portion. It was sensational! 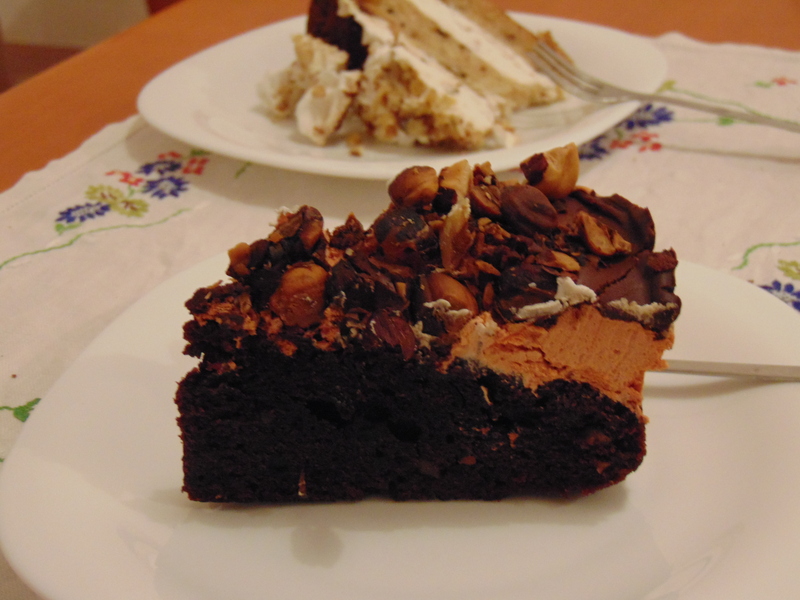 Chocolate almond cake, two ways on two days: it tasted a bit of marzipan, thank to the almonds, and had a good bake. The icing was sensational! Chocolate peanut butter: not as gooey and sticky as you’d hope. Gluten free chocolate peanut butter: much more like it! 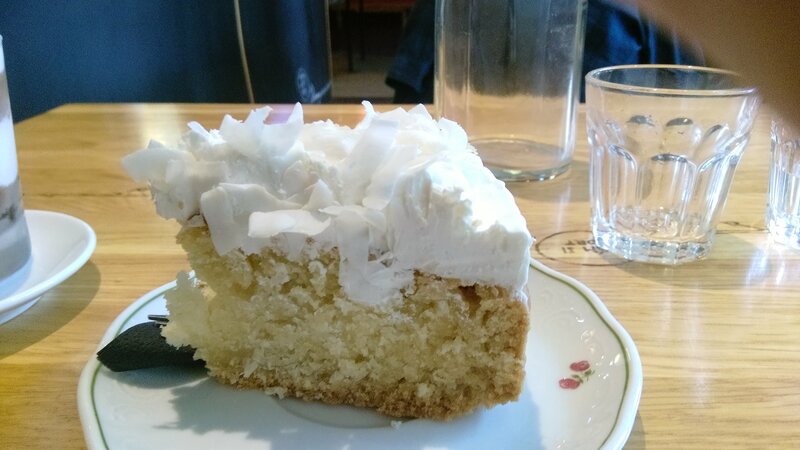 Coconut cake, two ways: one of the best, for its moistness. 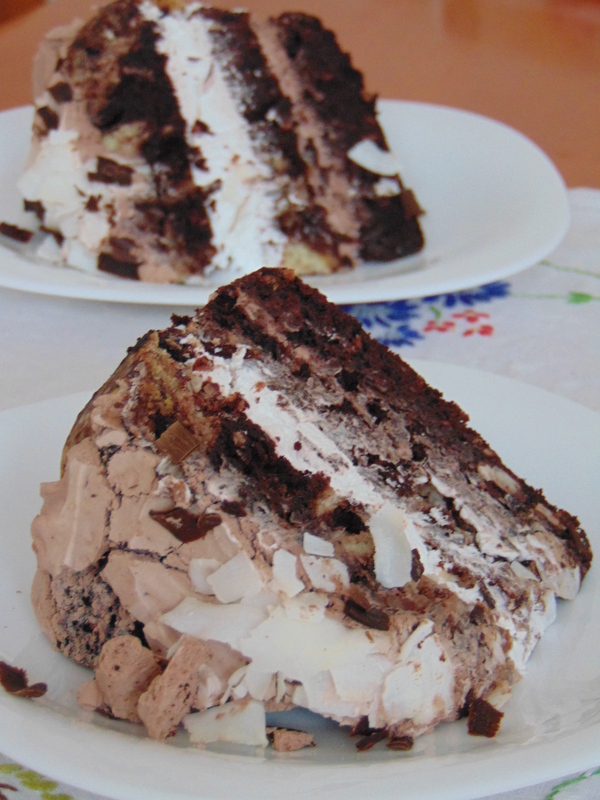 Chocolate coconut layer cake: simply delicious! 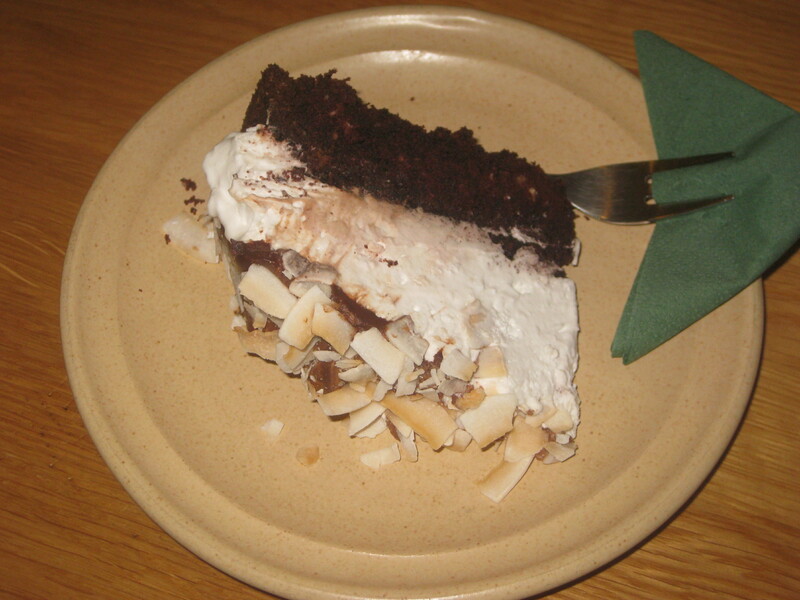 Gluten free chocolate and coconut cake: the sponge was a bit dry, but the cream on top was sublime. That is my kind of cake ratio. 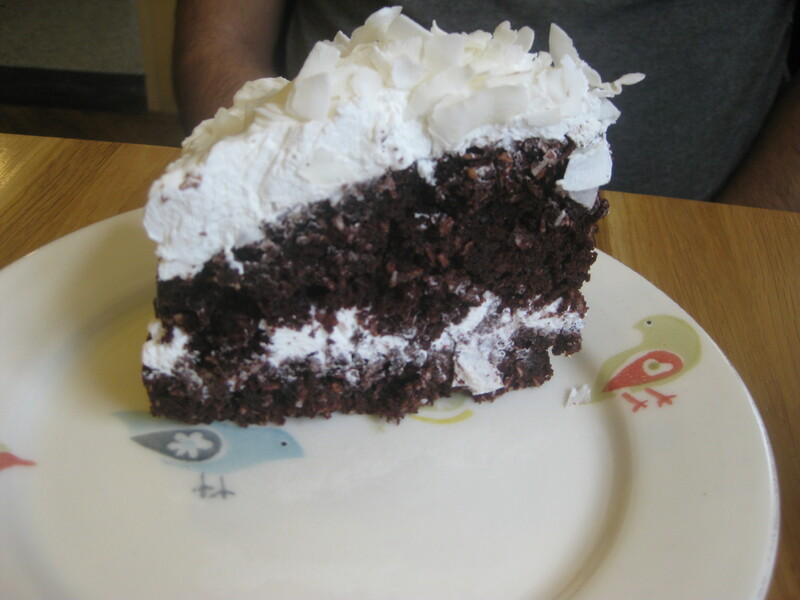 Giganto chocolate coconut cake: it was described to us as a “skyscraper”, as all cakes should be. Poppy seed: again, that is my kind of ratio. 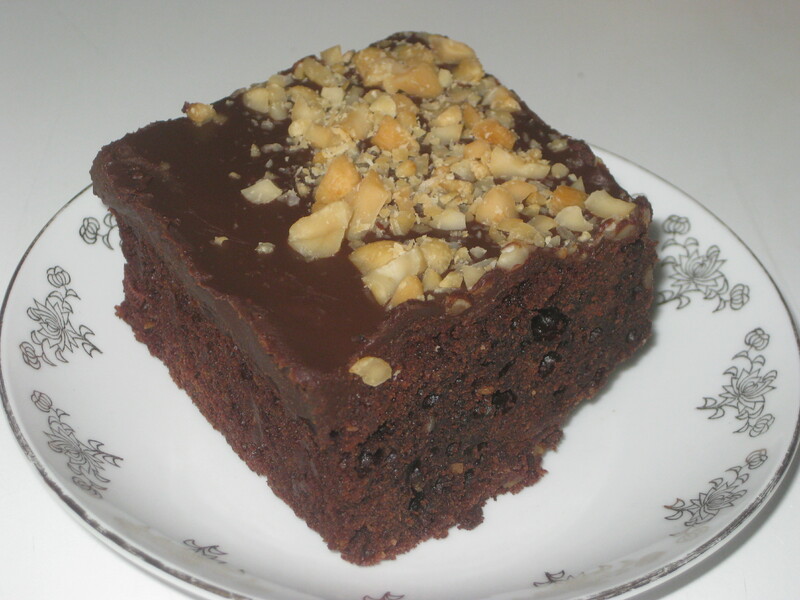 Chocolate chip cake: gloriously thick chunks of chocolate. Delicious! 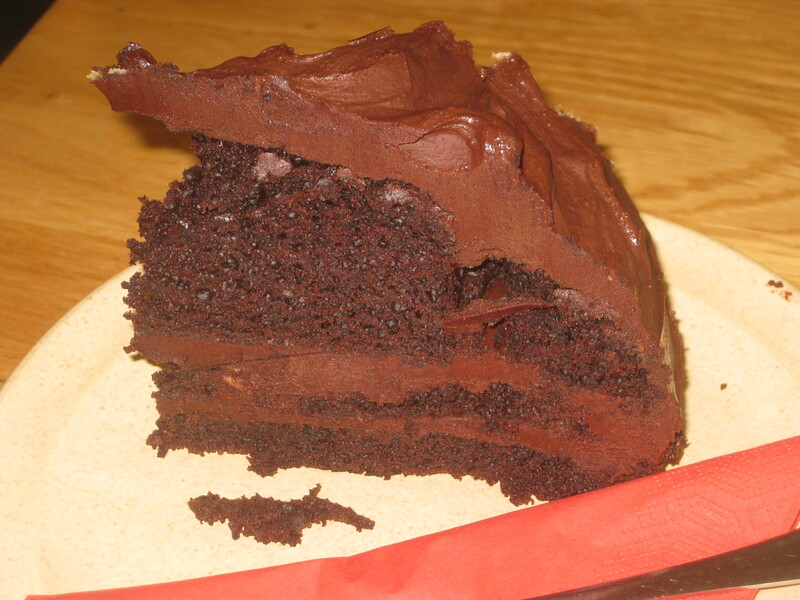 Chocolate cake: rich and indulgent, but a wee bit dry. 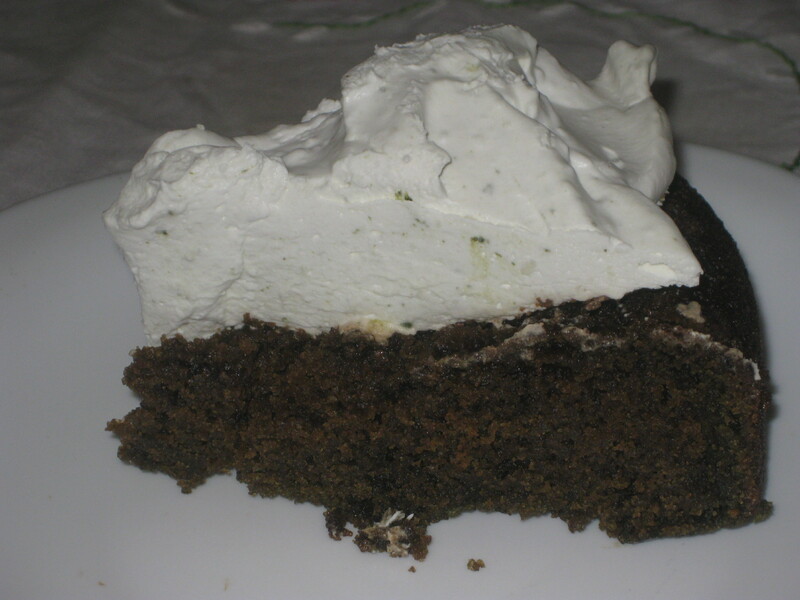 Carob cake: it didn’t taste strongly of anything, but it was perfectly pleasant. A chocolate peanut butter brownie, for that rare day when I don’t want a huge slab. Sweet cup: occasionally we branch out and have deconstructed cake and cream in a cup. It’s amazing, but it fills you up, so be warned! That is a lot of cake! Which one would you order? 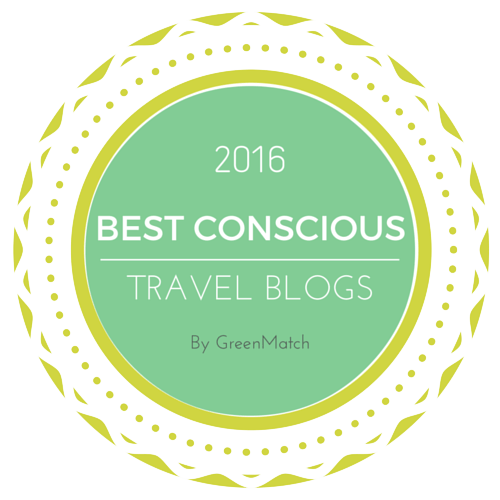 This entry was posted in Travel, Vegan Mofo and tagged Moment Prague, vegan mofo, vegan Prague, vegan travel, veganmofo, vgnmf16. Bookmark the permalink. So much cake! Wow! I’m jealous of all your cake. 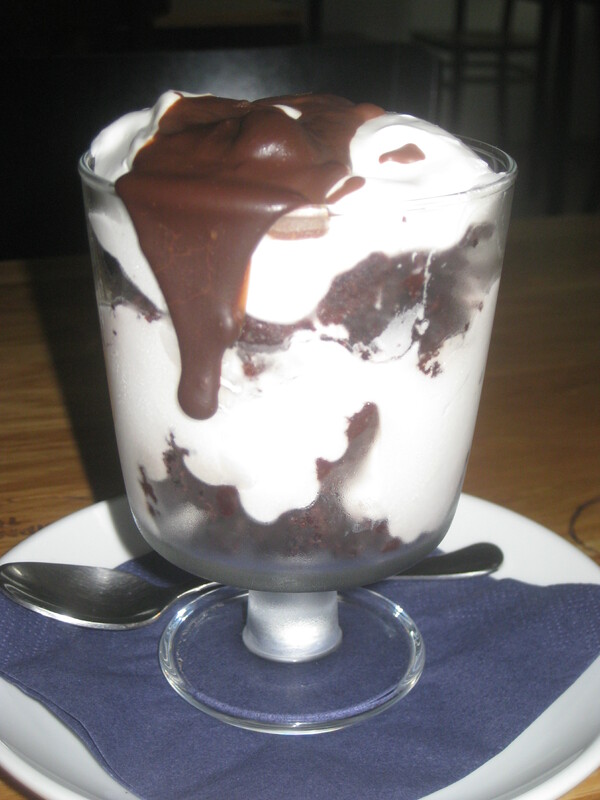 That deconstructed cake in a cup looks amazing, I would totally order it and eat until I felt poorly! In light of all the cake we’ve eaten, I’ve actually put us under a cake ban from the GBBO final until we go home for Christmas. We’re still debating whether the sweet cup counts as a cake. 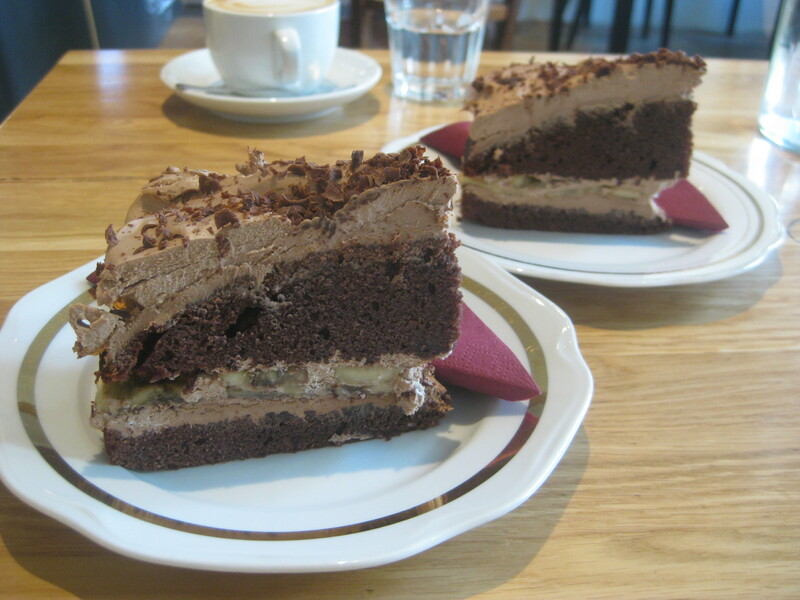 OMG so much cake in Prague, I was going to comment on the museum but you cake pictures distracted me. 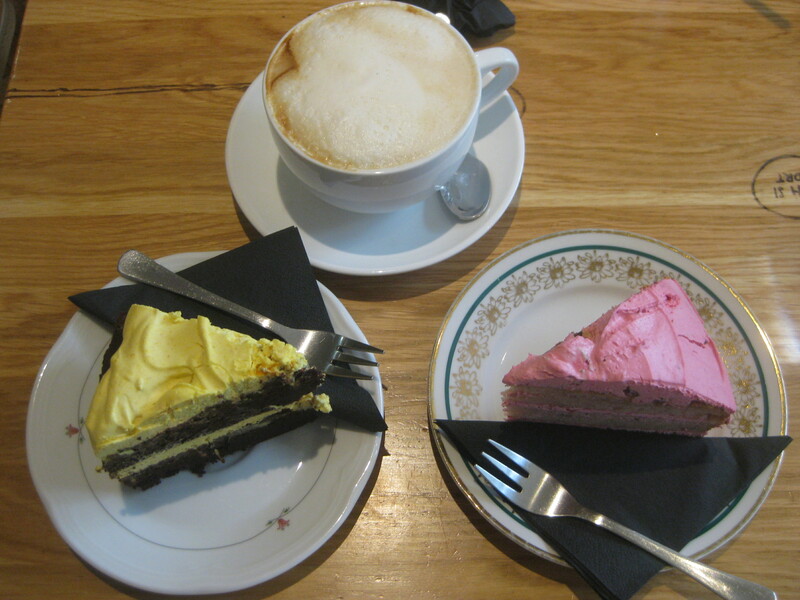 So much cake, i thought there was no end to this blog post 🙂 The museum exhibition is very poignant for this time, you are so right that the Czech are not the most diverse and welcoming of migrants – ironic as many Czech EU are in the UK and many recent victims of hate because of BREXIT. I have a good friend who is actually Czech and married to a Bangladeshi man and says she would never take him back to the CR because it is overtly racist and she would fear for him. I will have to tell her of this Hate Exhibition she will be interested. My partner is a Sikh and he finds it a bit difficult here, but still enjoyable for the most part, so I hope your friend and her husband won’t be too discouraged. But it’s certainly a big difference from the multicultural society in the UK. Wow that is alot of cake! And an amazing level of cake analysis! If there’s one thing I know, it’s cake! You’ve just single handedly persuaded me that I need to get back to Prague as soon as possible, if only for the cake (and the art too!) 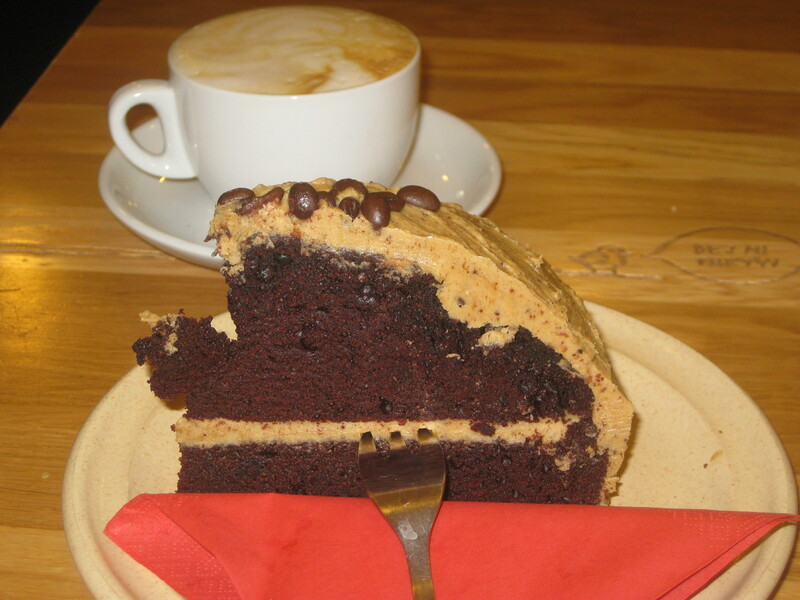 I love any kind of coffee cake, so I’m taking that one please! The cake alone is reason enough! Stop — I’m drooling! I visited Moment three times during a three-ish day trip to Prague, so I feel you on the Moment love! It’s amazing, isn’t it? I do eat savoury food there as well sometimes! Wow! I can’t believe how many cakes there are. It’s a good thing Moment only has a few on the menu at once because I’d be stumped with all these options. What to order? 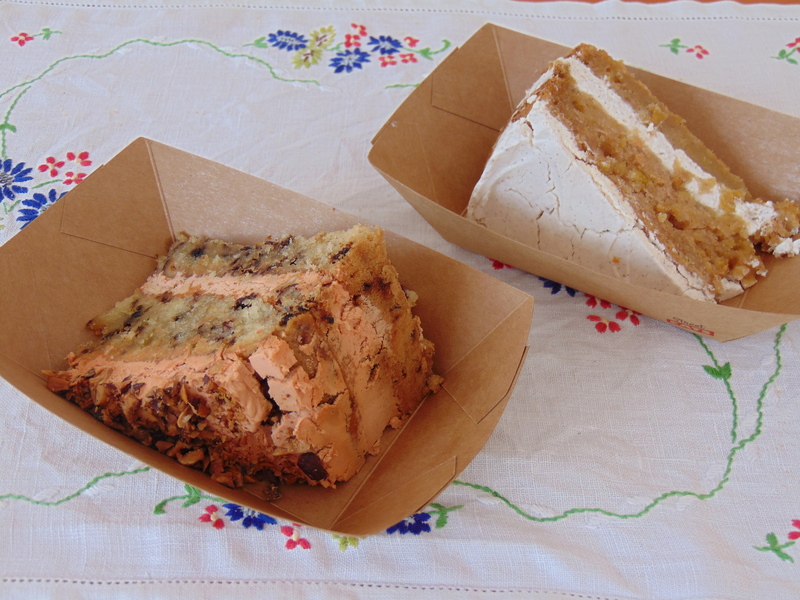 The pina colada cake, the chocolate banana, the baobab and chocolate chip cake (it looks weird and delicious), hazelnut vanilla or hazelnut chocolate, or coconut cake?? Oh man! Definitely spoiled for choice! 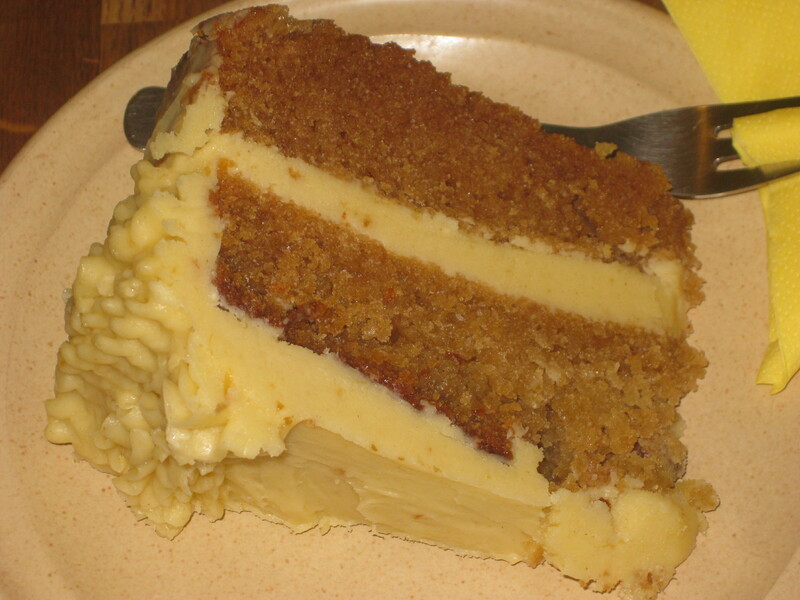 I’ve only seen the baobab cake once, more’s the pity. Wow, spectacular assortment of cakes! The rosemary apricot and lemon basil both look very tempting. And as they’re fruity, I believe they both technically count as one of your 5 a day! Anyways, that exhibit looks awesome. It looks very anti-capitalist, which I am not sure if I think the world will ever leave capitalism, I find the philosophy really interesting. A lot of my Czech students and friends are also surprised when I mention that I think racism is a problem here. It’s such a white city that most people don’t know anyone who’s been a victim of racism and they don’t think the racist attitude really manifests itself. Onto happier topics: I’ll be interested to see the results if you make a mole cake! They really are delicious. And if it’s any consolation, vegan donuts are so scarce that they’re virtually non-existent in most cities I’ve visited in Europe and the UK, so you guys are definitely winning on that front!